We spend a lot of time on this site talking about pitchers: How to train them, how to tweak their mechanics, what causes their injuries, the importance of mobility, and so on and so forth. However, we train hitters at Driveline Baseball as well, and most of our pitchers also can stroke at the plate too! Most of our base training revolves around improving rotational power, so it’s no surprise that the same training that improves fastball velocity also increases bat speed! Still, you have plenty of people out there who think that simply throwing medicine balls and taking lots of batting practice is good enough. Or maybe they suggest doing bodyweight exercises like push-ups and pull-ups. But never full squats – and definitely not scary Olympic lifts like the power clean! The “Big Three” exercises should be used during the Base Cycle (Periodization) for strength development. FREEWEIGHTS AND DUMBBELLS ARE THE BEST EQUIPMENT FOR STRENGTH DEVELOPMENT. Believe it or not, the capital letters are not my addition to his recommendation – he actually felt that strongly about it! Simply put, strength development leading to rotational power development will give you the bat speed that you’ve always wanted – meaning more doubles and home runs. He’s only been training the Olympic lifts seriously for the past month or so – and performing them in Chuck Taylors for the most part! Anyway, today he finished up his sets of front squats and I finished up my weighted ball throwing, and before we pushed the sled, he wanted to take some batting practice for the fun of it. Jack hasn’t swung a bat since the late spring when he played baseball for a select team after his HS season ended – I just want to make that clear! Always a guy with decent power, Jack stepped into the batting cage and I grooved him some fastballs. He fouled the first one straight back, but I could tell his bat speed was scary fast. The next pitch he sent right over my pitching shoulder past the L-screen screamingly fast! I threw him a bucket of baseballs and he continued tearing the cover off the ball – almost always centering it and getting tons of lift. After the session, we laughed about how he hadn’t swung a bat since May and that simply getting stronger and more powerful made a huge impact. He credits the Olympic lifts for his huge boost in power. Do you want that kind of improvement? All it takes to get that kind of bat speed, strength, and power is to simply join one of our affordable Semi-Private Training groups. Drop by our facility for a free no-obligation session to see if we’re your kind of people! Simply shoot us a line and contact us. A couple of questions about the big 3 lifts. Eric Cressey does not advocate bench press due to shoulder issues. How do you get around this? A floor press? Also on your squats, do you use a safety bar or cambered bar to prevent stress on the shoulders? Most of our pitchers do not straight bar bench press – they are doing DB benches, which gives a little better training effect for the scapulothoracic muscles. The real issue is the fixed-pronated position of the barbell bench press and standing press. Eric’s guys do DB bench variants as well. We don’t use a cambered bar for squats. I wrote a bit about why I think the “peel-back mechanism” of the back squat externally rotated position is actually a net benefit in novice trainees. Our pitchers tend not to power clean either – they’re often doing weighted jumps or other plyometric motions to get that explosive training effect. Do you have DeCoop’s other books and if so, how are they? 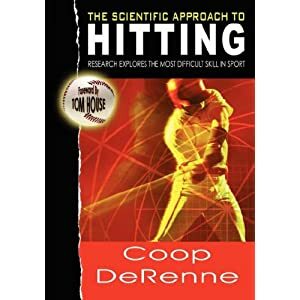 I just bought the Science of Hitting on your recommendation. I only have The Science of Hitting, but I have read nearly all of his research papers. They’re great.